Happy new year! I’m excited to be writing my first review of 2012. 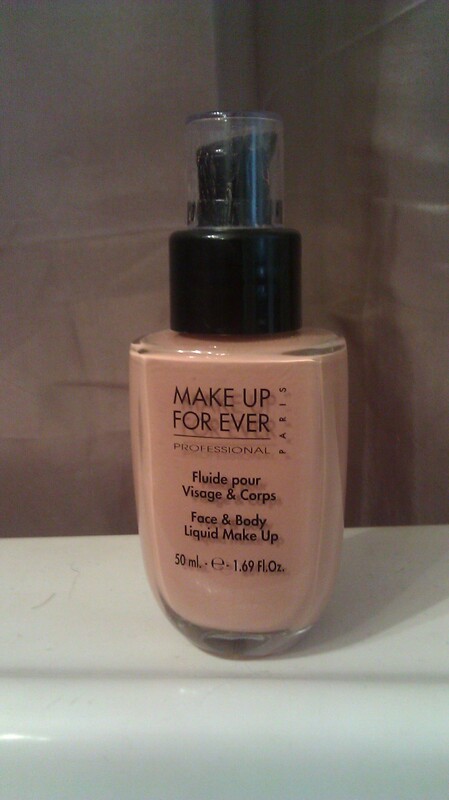 A good friend of mine requested I do this review because she is looking for a new foundation, so here it goes. I have been a Pur Minerals devotee for the past two years but a coworker of mine that is also a beauty junkie raved about MAKE UP FOR EVER so we went to Sephora where it’s sold exclusively so I could try it out. This brand was founded in 1984 by a painter and sculptor looking to develop a makeup line for the show business industry that could stand up to the bright lights of stage production and now high definition cameras. I bought the Face & Body Liquid Makeup. It’s a waterproof, light weight, water-based gel that feels silky going on and gives almost an airbrushed finish. It can also be used to cover imperfections on the body, it starts out sheer but you can easily get more coverage by applying more. I prefer a sheer coverage myself and only layer it once or twice. My face always feels soft and natural after I apply it and it covers the dark circles under my eyes and the red little veins around my nostrils. I hear that this holds up well in hot weather which I plan on testing out when its 110 degrees this summer. Vegas summers are the absolute worse and you pretty much accept the fact that your makeup will be melting off your face as soon as you apply it. At 38$ it’s well worth the investment, I’ve had it for two months already and it’s still practically full. A little goes a long way and I bet this will last a full six months if not longer. I wear #34, I haven’t figured out their number system but the nice ladies at Sephora will be more than willing to match you to the perfect shade. For more information on MAKE UP FOR EVER click here. thx i will try this!